Today I thought I would answer one of the questions that I get asked the most. 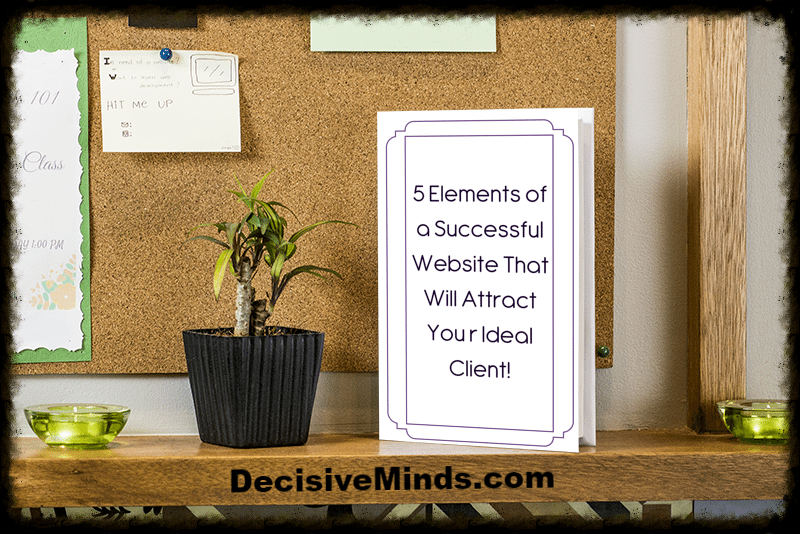 “Michele, what do I need to have on my website?” Creating an effective website is actually very simple. It is a matter of asking yourself how to make your website face toward your audience rather than be “all about you”. If you can do this, you’ll be ahead of most of the websites out there; mistakenly most websites focus on the business rather than the customer. 1. A clear target market. When somebody comes to your website, they should feel as if you have written the site “just for them”. The more tightly you have defined your ideal client, the easier it is to tailor your web copy. 2. An effective website builds your email marketing list. Make sure the Opt-in Box is visible (without scrolling). This is one of the biggest mistakes I see businesses make. Many websites don’t have a way to collect peoples e-mail addresses. Without an e-mail address, once the customer leaves your site you have no way of knowing who they were. With an e-mail address, you have a chance to offer more information, add more value, and deepen your relationship. Another mistake I see way too often is burying the opt-in box at the bottom of the page. If your prospect doesn’t stay on your site long enough to scroll down — you’ve lost them forever. 3. Clear and Easy Navigation. Your prospect should be able to easily get to the information they’re looking for. An easy way to see if your navigation is meeting the needs of your customer – is to think about the questions people ask you the most. The answers to the most common questions/objections should be prominently featured on your site. 4. Effective websites are easy to share. You should have social media share buttons to make it easy for others to share your entire site as well as your blog posts or services. Remember, people are not going to work hard to share your content. Well…they actually won’t work at all, so if the share buttons aren’t easily visible you can hang it up. 5. Easy Connections: People do business with people they “know, like and trust” — the best way to build that relationship is to make it super easy for people to connect with you via the web. Connections can happen via blog comments, social media, or even a simple contact page on your site. A bonus is that lots of comments on various social media channels is a quick way to build your credibility by offering “social proof”. Let’s test this. Click on one of the share buttons below and share this post on Facebook, LinkedIn or Twitter.